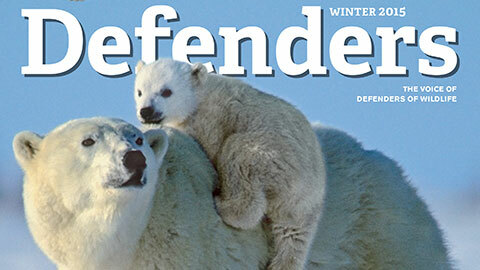 Home | Learn About Wildlife | Defenders Magazine | Spring 2012 | Brighter Days Ahead? For desert tortoises, bighorn sheep, golden eagles and other species in the West, the future is looking brighter now that hundreds of thousands of acres of wildlife habitat on public lands may no longer be threatened by large-scale solar power plants. Moving to create the nation’s first solar-energy program for public lands, the Obama administration recently released a supplement to the draft plan that dropped some of the earlier proposed solar-energy development zones in the West that could have wreaked havoc on wildlife habitat in Arizona, California, Colorado, Nevada, New Mexico and Utah. These included the controversial Iron Mountain zone near Joshua Tree National Park and the Pisgah zone, both in California. Defenders opposed the large-scale developments because they would have interfered with the movement of desert tortoises, bighorn sheep and other species. To accelerate the move to solar energy without sacrificing imperiled wildlife, Defenders and other conservation partners worked with solar industry representatives to identify zones for solar-energy development that avoid a cumbersome project-by-project approach. With environmental issues already generally evaluated in designated solar-energy zones, the normally lengthy approval process for developers using public lands is made more efficient. “The benefits of guided development are clear,” says Jim Lyons, Defenders’ senior director for renewable energy. “Clean energy can come online faster, while sensitive wildlife and treasured places are protected. The revised plan has reduced the amount of public land available for solar development. “But the proposed zones appear to offer a bigger shot at success,” says Kim Delfino, Defenders’ California program director. “The remaining zones, which still total nearly 300,000 acres, have been refined to help developers avoid and minimize the worst impacts on wildlife and the environment. She adds that there is potential for new solar zones as the Interior Department continues to identify places in the desert to protect or to declare suitable for renewable-energy development. Defenders and its conservation partners will continue to work to make sure the final plan results in real protections for wildlife in sensitive areas like California’s Pisgah Valley.